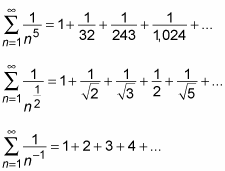 As with geometric series, a simple rule exists for determining whether a p-series is convergent or divergent. A p-series converges when p > 1 and diverges when p < 1. Here are a few important examples of p-series that are either convergent or divergent. This p-series is important enough to have its own name: the harmonic series. The harmonic series is divergent. Because p > 1, these series are all convergent. So this p-series includes every term in the harmonic series plus many more terms. Because the harmonic series is divergent, this series is also divergent.